2019 is upon us and we've got a LOT of really cool things we're going to be doing this year. More to come on that later this month after we get back from our Cozumel dive drip. But one cool thing we're doing for new divers is changing some of how we discounted gear for new divers. 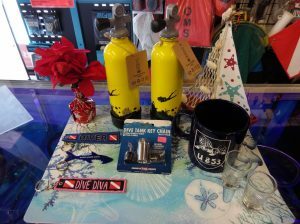 First we're dumping the $50 credit for buying your personal dive gear from us and instead giving you your snorkel for free if you buy the mask fins and booties along with an Open Water Scuba class! So instead of having to buy a Mask, Fins, Boots, Snorkel & OW Class to get a $50 discount off the class, just buy the Mask, Fins Boots & OW Class and get your choice of Aqua Lung snorkel for free! Also we're looking to expand the number of charters and trips we're running but we want your feedback! Let us know where you want to go to dive in 2019! Give us a ring, send an email or facebook message or post on our page on Facebook. Let us know what local dives sites you'd love to see us host local trips to as well as dive vacations. More to come in early February, stay tuned here and more importantly our Facebook page as we do most of our updates there!